I sat in my first séance in 1969 as part of a CBC radio special, "Houdini in Canada" (see Freelance Broadcaster), for which I hired a Spiritualist medium. 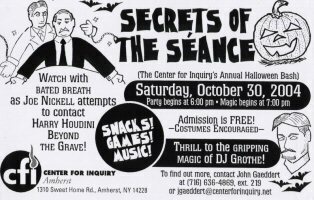 I have myself conducted séances annually, on or about Halloween, since 1996 at the Center for Inquiry. The events typically included entertainment, such as a film, magic show, lecture, costume ball, etc. Since 2007, the annual séances have been held online at our Point of Inquiry podcast. Houdini has always been a no-show, consistent with his skepticism regarding spirits of the undead.